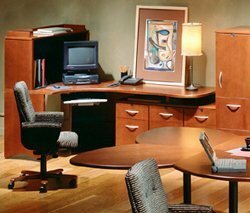 Since first opening in 1994, NorthPoint Office Furniture has been a family-owned and -operated business proudly serving Kennesaw, Georgia. Throughout the past decades, we’ve grown into one of the foremost providers of new and gently used office furnishings for residents of the region. With over two decades of experience in the industry, NorthPoint has helped countless satisfied customers find premium and affordable pieces that deliver complete reliability, durability, and, of course, style. This is because NorthPoint only offers the top echelon of brands in the office furniture trade, including DMI, Global, Fairfield, HON, Humanscale, and Office Star. What’s more, all of our products come with exceptional manufacturer warranties. At our conveniently located 8,000-square-foot showroom, NorthPoint proudly provides a pristine, welcoming environment where customers can browse and inquire about our vast inventory. Additionally, our fully modeled office displays enable our customers to easily visualize the office furniture within their own home or workplace. Thanks to NorthPoint’s tremendous dedication to customer care, we believe in taking the time to learn exactly each of our clients’ needs, all while working within their individual timeline and budget. Additionally, if any of our customers are unsure of how to make the most of their layout, one of our well-versed professionals can assist in space planning. For more information about NorthPoint’s top-quality office furniture options, contact us today. You can also visit our showroom, where you can speak directly with one of our furnishing experts and learn more about how we can help you optimize the aesthetic and functionality of your Kennesaw, GA, workspace.